A lot of energy monitors will tell you the how much energy you use at any given moment but how many do it using the color blue? If you guessed “at least one”, you’d have guessed correctly. That’s right my energy efficient aficionados, this energy monitor does almost anything you could want and it does it all with a whole lot of blue. If its outstanding blue interface isn’t enough to grab you, let me direct your attention to the clever appliance device detection. 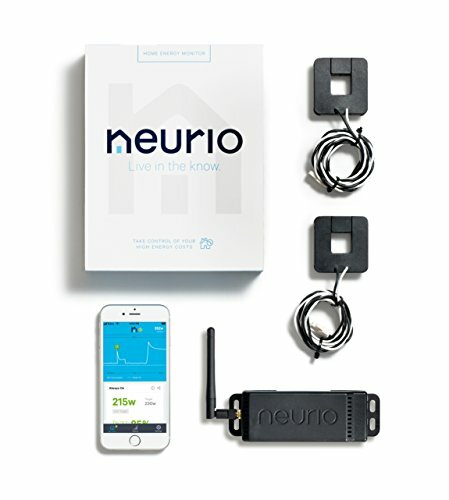 For an additional fee and a few hours of your time, you can have the Neurio W1-HEM automatically log how much power all the major appliances in your house are using. The Neurio W1-HEM started out life as a university project. The designers put it up on Kickstarter in 2013. It was incredibly popular and absolutely blew through their initial goal of $95,000. The company has focused almost exclusively on the one product although their website does indicate that they’re working on something called a Home Energy Controller. One thing I love about the Neurio is that you get to hide everything away inside the breaker box. You don’t need to set anything up inside. It’s a small detail but as a person who hates clutter, I appreciate that I don’t have to worry about one more gadget to find a home for. The downside of this is that if your breaker box is far away from your WiFi router, you might get patchy signal or no signal at all. The sensor doesn’t store data locally so if the WiFi connection isn’t solid, the information is going to be grossly inaccurate. I would say the Neurio W1-HEM is somewhere in the middle with regards to difficulty of installation. There are a few (like the Curb) which require a lot more time and effort. If you’re paying for an electrician, this can really add to the cost of the device. You (or your electrician) should be able to do the job in less than half an hour. Installation will require opening up the breaker panel in your home (this is standard for most whole home energy monitors). Parts will remain live even when even after you have switched all the power off so call in a qualified electrician if you feel at all uncomfortable doing this. Neurio provides some videos that walk you through step by step and there’s a guide on their website. Very basically, what you need to do is attach the two CTs to the main power lines, attach the voltage wires to an empty breaker, stick the entenna in a spare punch out hole and connect it all up to the Neurio sensor. Once you’ve done all that, the software will help you connect to your home wifi connection. They also host their own support forum so users can help each other solve problems. I really appreciate that they have done this, it really shows that they actually care somewhat about the individual users. All data will be uploaded to the cloud and will be available to you where ever you are. You can access the data through the web interface or through either their Android or IOS apps. If you want to fiddle with the data yourself, you can download the CSV (spreadsheet data) yourself. Despite the its Kickstarter origins, the apps are surprisingly well maintained and bug free. The interface design uses the design philosophy that seems to be all the rage at the moment. It is minimalist and slick using flat colors clean edges with a blue and white color scheme. The ‘My Home’ screen gives you most of the information that is available. The first item you’ll be greeted with on the home page is the real time energy usage. The graph is very quick to respond, you should see the graph update within a second of flipping a switch. It can either show you consumption over the last minute or over the last day. It only has these two options so if, for example, you’re interested in the last 10 minutes of data, you’re going to have trouble picking out the information when the graph spans 24 hours. This problem is confounded by the fact that there’s no scale or markings on either axis. You’re only given information about the minimum and maximum value. I think this is a case of the designers taking the minimalist concept a bit too far, some scale information here would not have gone astray. If you have the solar pack (and of course solar panels in your house), the next item is for you. It gives you a handy display that shows how much grid energy you’ve consumed versus how much you’ve generated. The bill forecasting section is up next. It displays a graph that shows how much electricity it thinks you will use by the end of the current billing period. It also gives you a dollar amount for how much you’ve used so far and how much it thinks the bill will be. You can set a budget and it will give you a warning if it thinks you are likely to go over that budget amount. Finally there is your ‘always on’ score. This is your base level of electricity consumption. Reducing this can have a significant impact on your yearly bill. One handy feature is that it shows how you compare to other houses of similar size. This may not seem like a big deal but studies have shown that knowing how much electricity your neighbors are using is a good motivator for reducing your own energy consumption. If you tap on ‘History’ you’ll be given a graph of how much electricity you’ve consumed in the past. You can choose whether this is displays the last day, week, month or year. The interface is well laid out and easy to use. It gives you all the information you really need and, did I mention, it has a marvelous blue and white color scheme. The only drawback is the lack of precision in the real time energy usage graph. I would have liked to be able to get a more accurate reading here. Out of the box, the Neurio W1-HEM offers IFTTT (If This Then That) compatibility. IFTTT is an app that allows you to set one trigger and one action. It is very popular among users of ‘smart’ devices because it has the power to make a lot of different devices communicate with each other. For example, the trigger might be ‘the power consumption is above 2000W’ or ‘the solar panels have stopped generating electricity’. The corresponding action might be ‘send me a notification’ or ‘dim the lights’. It’s a simple idea that has a lot of power. I do appreciate the inclusion of IFTTT compatibility with this device, there aren’t many energy monitors that support this. I wish there were a few more options though. Especially in combination with the appliance monitoring. I feel there’s a bit of a missed opportunity here with how much functionality you can expect to get out of this feature. For instance, it would be great to know when you’ve left the stove on for too long. You can find IFTTT triggers and actions that other people have already made on the website. In my opinion, a very useful one is this one. It sends you an alert if your power consumption is too high. Neurio have been kind enough to provide a public API. Those of you with some programming fu can dig in there and code your own apps etc. If you have a dig around GitHub you can find some handy tools that other people have built. One user made a tool that uses a Raspberry Pi and and an RGB LED to act as an indicator for the Neurio. There’s also a tool for displaying your power consumption on your Wink Nimbus Clock and another tool for displaying information your Pebble. If you own a SmartThings hub, this site has a custom device and service manager. Just monitoring the current will not give you accurate information. Actual voltage will vary considerably compared to how many volts your house is supposed to be getting. Fortunately, unlike some of its competition, the Neurio W1-HEM does take into account the actual voltage coming into the breaker box. This means that so long as you have it set up correctly, the readings you get on the app, should match very closely to your actual readings. The responsiveness is also excellent with this device, the app reliably registers changes in current within the second. You’ll have to pay extra for the appliance monitoring software upgrade. It’s a little bit sneaky how Neurio have done this because they haven’t made this very clear. I think the website could do a better job of informing people because a lot of people have bought the energy monitor thinking that they were getting appliance monitoring as part of the package. Appliance detection requires a minimum draw of 400W to register so you’re not going to detect individual light bulbs or anything but you should be able to detect the big energy guzzlers: microwave, stove, oven, hair straightener, that kind of thing. Unfortunately, you will not be able to monitor televisions, lights, media players, etc. To set up an appliance, you’ll need to start by turning off as many appliances as possible. Once that’s done, put the app into appliance detection mode, turn an appliance on, wait 10 seconds for it to be detected. Once detected, you’ll be able to give it a name. Rinse and repeat for every single appliance in your house. This sounds like a tedious process… and it is… but it does mean you can add all the devices you want to add in a single day. Some of the other options have automatic detection and that can take a month or more. The appliance monitoring works well in simple situations but you can confuse it pretty easily. For instance, it might stop working correctly if you have a lot of appliances on at the same time or if you turn on a few appliances in quick succession. I wouldn’t recommend it if you want to know exactly how much each device is costing each month. The feature works best for small houses or apartments, it’s performance really starts to degrade with larger houses. Neurio is always improving its software so there’s a chance that in the future, these problems will be less severe. The Neurio W1-HEM is one of the most ambitious energy monitors that I’ve come across. It’s got a great design with the ability to access information both on and off the internet, IOS and Android apps, a public API, IFTTT compatibility out of the box and appliance monitoring. It does a really solid job of delivering on almost all of that. The one sore point for me is the fact that you have to pay extra for the appliance monitoring. The fact that it’s a bit uncertain whether it will actually work well enough to be useful for your particular home means that there’s a risk that purchasing the add-on will be a complete waste of money. If you’re not interested in appliance monitoring, and you want an energy monitor that has the ability to communicate with your existing smart devices, the W1-HEM is for you.